Shake it off? No, sit with it. Long before Taylor Swift turned it into an ear worm (you’re welcome), my dad used to tell me “Shake it off.” It was a multi-purpose instruction, aimed at minor injuries both physical and social. While that’s good advice for a stubbed toe or even a bruised ego, some experiences jar us in ways that shaking will only amplify, because we are already shook. If you’ve ever been on the receiving end of a drive-by dagger in the handshake line, or a late night email intended to wound, or a theological snubbing, you’ll know what I mean. For me, step 1 is to sit with it. Today I’m doing that sitting in a Starbucks, pampering myself with a piece of coffee cake and a mocha topped off with the whipped cream I usually eschew. I’m thinking about something that happened yesterday, trying to figure out what to do with it, and what the ramifications of sharing the story publicly might be, for me and for the work I do. I’m asking myself, could it be helpful to share, or would I just be relieving my own tension? Often, step 2 is to tell the story to a trusted friend or colleague, or perhaps a therapist, spiritual director, or coach. If you don’t have one of the above, I hope you will find one before the need is urgent. In my two pastor household, we have the trusted colleague available 24/7, and for that I am grateful, this day and every day. Still, for those times I need to tell the story 83 times before I feel finished, it’s good to have more places to put it. Step 3 for me is always to write about it. Sometimes that writing is an email I will never send, or a fragment saved in the Notes app on my iPhone that will find its way into a more polished form months or years in the future, when I have more perspective. And sometimes it’s like this, an exploration of how it feels to be injured, without saying anything about what actually happened. It’s an effort to make sense of things, to determine whether I was responsible for something I haven’t acknowledged, and whether I was actually wronged. In this case, I’m pretty sure I was, but before I take it anywhere else, step 4 needs to happen in conversation with scripture, and in prayer. I’ll confess that since I stopped preaching regularly, I find this part harder, because for years this step took place for me in regular engagement with the lectionary. Having lost track of where we are in year B, I had to look it up. There I found the Syrophoenecian woman, like a trusted friend, ready to hear my story and feel it with me, right here in the Starbucks. I don’t think this is a situation to shake off, but thanks to her, I’ve remembered where healing comes from ultimately. Now I’m ready to brush the coffee cake crumbs off my lap and go on with my day. Wherever you find your friends, may it be the same for you. 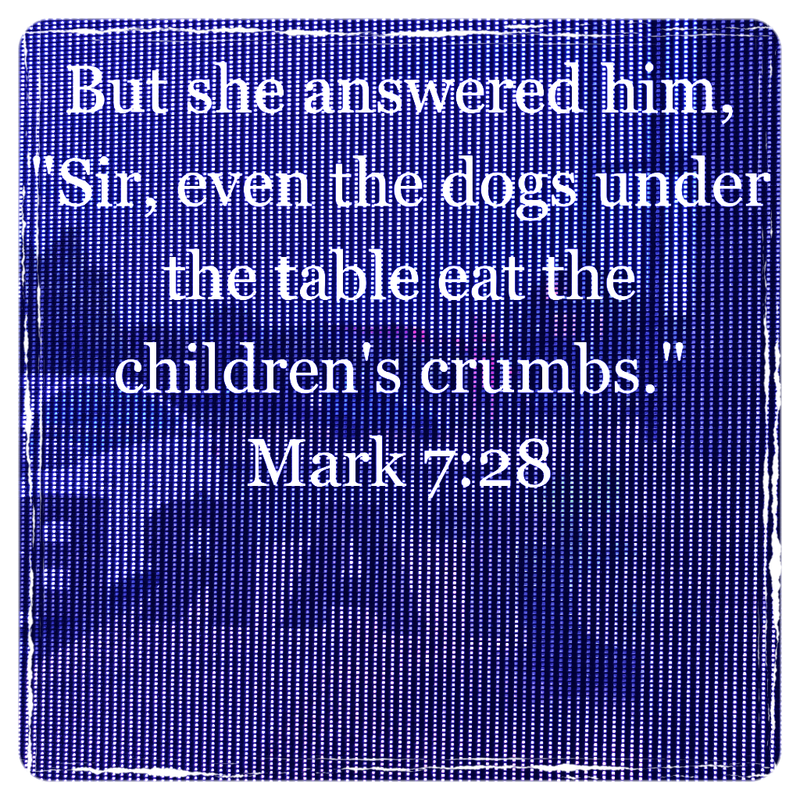 This post originally appeared in the RevGals Weekly e-Reader. A corner of my city. In this generation of the game, which is much more sophisticated and complex, you have the choice of which areas of city life to develop, and unless you pay for extra SimCash and coins, those choices have to be made based on the budget you can raise yourself by creating and trading resources. I’ve been focused on ground transportation and education, versus entertainment and gambling. Some of the in-game challenges involve choosing disasters and wars that will allow you to earn more. I’ve read that you can always rebuild. In fact, that’s the point. You achieve more by allowing the disasters and rebuilding after them, or fighting the wars and reconstructing your city. But I cannot bring myself to do it. The real world is hard enough. We do something similar in the life of the church when we dream about what we might build, but we also consider the limits for what is possible. What can a particular congregation do well? What is needed in the community? Where can we put our limited resources to make the world we are building a little better, on behalf of Jesus Christ? Playing the game my way, I don’t think I will ever save up enough to build the airport or the Parisian quarter my residents keep asking for in pop-up bubbles. But I am planning to stick with it at least until Level 40, when the game unlocks Worship. And I promise not to stay up all night to do it. 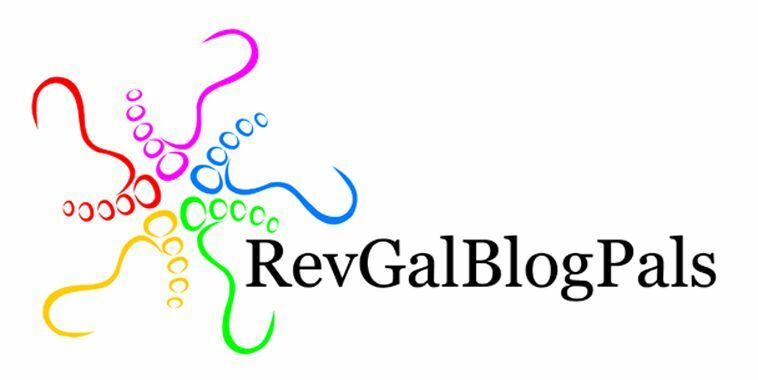 This post was written for the RevGalBlogPals Weekly e-Reader. The Boy wondered this, watching the news about the church shooting in Sutherland Springs, Texas. He has reached the age where he hears about the news at school, so we have become more open to having him hear and see things on TV, rather than trying to shield him from the hard things that happen. We need to be able to answer his questions ourselves. I don’t know if you have heard the common talk of 7th grade boys lately, but it definitely requires some counter-influences. It’s true that in church we are a special flock of sitting ducks, focused in one direction, both physically and spiritually. I rarely look around in church, when I am sitting in the pews, other than when we pass the peace. I estimate how large a crowd is behind me by the sounds they make. I’m trying not to seem overly interested in who is late, or whose children are making noise; I’m trying to be a good pastor’s wife. Up front, as the pastor and preacher, it’s different. I’m counting heads, noting who is missing. But even then, I am not worrying about disaster, or I haven’t been, even though I know Kathryn has a plan in case someone dangerous comes into the sanctuary. Experts offering their two cents worth on cable news recommended that churches review their emergency plans and look into security systems of staffing appropriate to their size and situation. Maybe, they suggested, someone in the congregation is already wearing a weapon to worship. I know this is true in some of my colleague’s congregations. It’s not clear yet what the shooter’s relationship to religion was. His social media accounts were quickly archived, but not so fast that some bad actors didn’t have a chance to create alternative “likes” and loyalties for him. What does seem to be clear is that a man with a history of domestic violence threatened his mother-in-law, and then he shot up the church she attended. This morning the President suggested that had a neighbor not fired at the shooter, there might have been hundreds of deaths. A better guess is had he not been given chase, his next stop would have been his mother-in-law’s house. We did our best to reassure The Boy, pointing out that the shooter did not choose a church at random. I’m not sure how comforting that is, really. How was a guy who cracked his infant stepson’s skull out on the street to do this? He choked his wife; he punched his dog. Why don’t we take these clusters of behavior seriously? We don’t because we undervalue harm done to women/children, overvalue white men and their chance of a future. This is magnified when we add race, sexual orientation, gender identity to the victim side of the equation. The permission given to this man to keep assaulting other people, the pattern of abuse he inflicted on others before Sunday, the ready availability of a weapon that can kill, terribly, so many people, so quickly – all these factors remain for other abusers, other men who cannot manage their anger or their disappointment or their frustration, who cannot resist the temptation of power and have the means available to deal out death. It might not be fair for me to make suggestions about what churches should do about their security when I am not serving one right now. Our own history as people of faith is problematic. Joshua and his house pledged to serve the Lord, but in the Promised Land, they used all their available weapons and powers to kill the people they saw as enemies, and to gain the land they wanted. They saw being the chosen ones as permission to deal out death. We should not be surprised that righteousness and power have been confused and conflated throughout human history. Why would anyone go to church now? Our boy doesn’t drop his questions until he gets a satisfying answer, and he usually asks them again, just to be sure. We will go because it’s what we do, just like we ride on a bike path, or go to the movies, or attend a concert. We will go because most of us cannot maintain the kind of hyper-vigilance required to be on watch at all times. We will go because we want to be with the people we know and love. We will go for solace, and solidarity. I’m not saying this is easy. In the United States, we worship our guns like no other nation in the world, and some will say more guns are the answer. I do not believe this. We need to be direct in saying the god of guns is a false god. 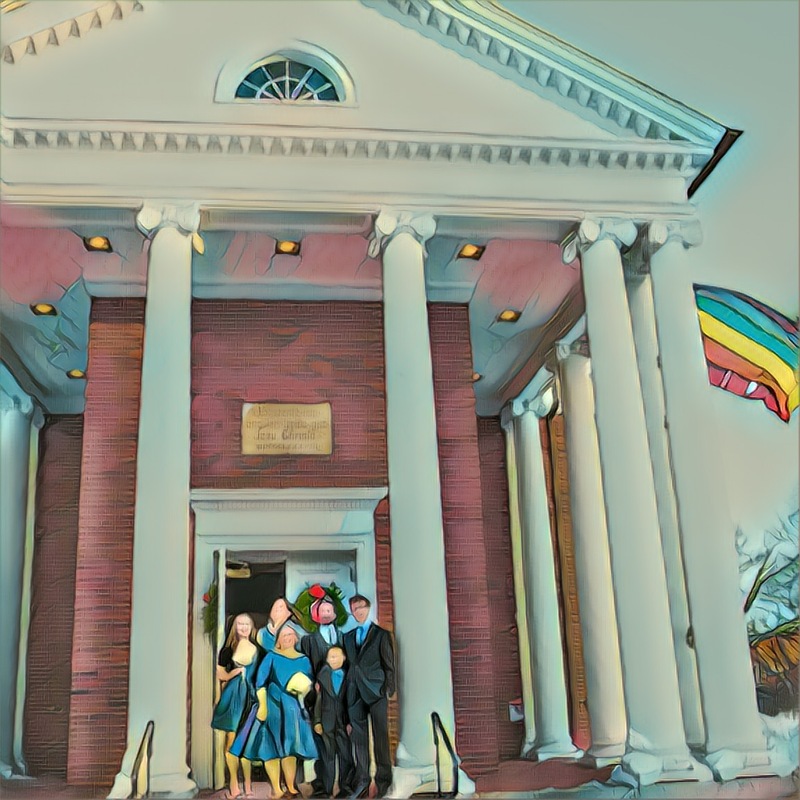 As much as I believe Jesus is among the grieving, I believe he is also pressing on his church to engage with the powers and principalities and say “No more!” Our culture privileges the powerful; often our church culture does the same. Yet we know Jesus proclaimed a preferential option for people who are marginalized and oppressed. We need the church to be a place where we talk about why mass shootings happen. We need to have those conversations and let God be part of them. We need to decide whether the church will be not just a voice speaking but a body acting to bring change in human priorities and understanding. If we have any power left as an institution, we must work together for good, in Jesus’s name. I could stay screened here across the street, watching for unfamiliar vehicles and people, but I want more than the safe view from my window.